In the last 2 years I have become a scotch drinker… so I found this one interesting. 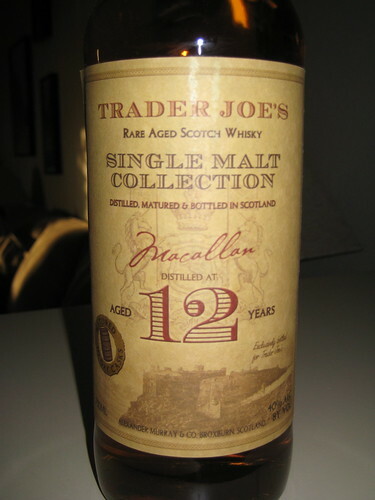 It seems Trader Joes has slapped their own label on a bottle of 12 year Macallan scotch and is selling it for $10 cheaper than any other store I have seen it at in the city. Same stuff. Cheaper price. Happier ferf. Yeah, but it’s the stuff at the bottom of the barrel, stuck down there with the gum and the cigarette butts. Still, if it’s Macallans, even bad is still pretty damn good. Yeppers, it’s great that TJs has that relationship with brand names that allow them to slap their own label on stuff and sell it so much cheaper. It’s a fantastic deal!